I have driven by the USS Alabama and jumped aboard it plenty of times in my life. It wasn’t until two years ago that I had the idea to shoot in front of the battleship. But I had no idea how much work and planning would go into making any of it happen. About a year ago, I decided I really wanted to shoot Steel Lafferty in front of the ship. I wanted to work with Steel because of his talent on a board and his amplitude. I knew it would make a great shot. 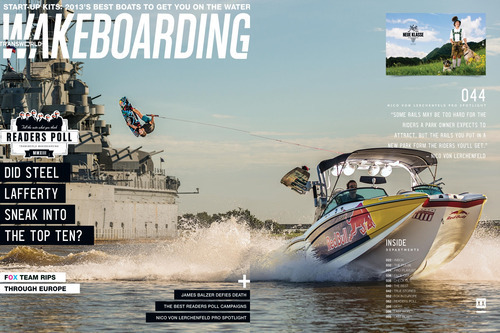 I also wanted this location to be my first cover for TransWorld Wakeboarding. Long story short: Steel ended up injured a few times throughout the year just before we had a plan to go shoot it. I had pretty much given up hope on shooting the location after two years of planning and trying. It appeared to be one of those dream shoots that would never happen. Mid-August, I was in Colorado shooting some advertising shots when I got a text from Perry at TransWorld Media. He asked if we had been able to get any shots in front of the ship yet. With the obvious answer being no, I asked him how much of a window we had to get a shot in. He responded with, “Deadline would be pushing it on Sunday, and I don’t know if that could even happen.” It was Wednesday. Steel was also on the road in California on a tour for Liquid Force. To top it all off, there are no boats anywhere in the area of the USS Alabama. I knew Red Bull had just received a new wrapped X-Star from Mastercraft the week before. That boat was in Orlando with both of the Red Bull jet skis. When I finally got a hold of Cullen at Red Bull and told him what was going on, he was immediately in. Well, immediately in after a few phone calls canceling a trip with the boat up to Tennessee and Georgia. I immediately booked a flight back to Florida and talked Steel into taking a red-eye flight to Florida on Friday, so we could have two days to shoot what we needed. Once we all met up, we made the 700 plus mile drive out to Mobile. We got into Mobile around 3 a.m. on Friday and were completely wiped out from driving in the Florida torrential downpours the entire way up. We ended up sleeping in and heading out to the ramps to drop the boat and skis in midday the next day. This was our first look at the location and the water conditions—which were a 9 on the worst conditions possible scale. The current was insanely fast. There were 2-foot swells and heavy wind chop. We ended up cruising around the Mobile Port area to explore and find some locations to ride in that were protected, while we waited for sunset and the calmer conditions that would come with it. We ended up back at the battleship with 30 minutes of light to try for a shot and at least test out the idea. The conditions were not the best, and we had to add in the factors of crab traps every 10 square feet all around the ship where we ended the shoot. We took a few laps and test shot it, so we could be ready for the next day at sunrise. The next morning, we got on the water around 5:30 to get everything ready. We came to the conclusion that we needed a double up shot to get Steel as high as he could go to get above the guns of the ship. 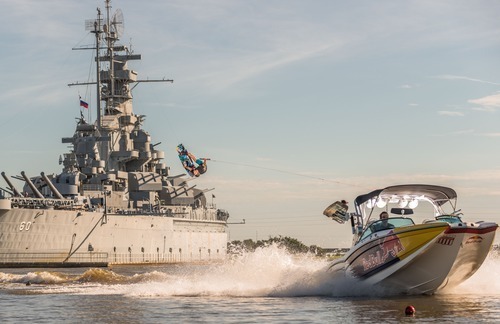 A double up requires a boat driver to drive a tear-shaped pass to allow the rider to cut in and hit the wake when the two come together, essentially doubling the height of the wake. This is a shot in which every angle and foot matter. If the boat starts in the wrong spot, is at a wrong angle, or takes the turn at the wrong time, it will not end up in the right spot. Basically, it was the hardest shot to get because nothing will ever even be close to the same. Not to mention, I was shooting flash, so I had only one click and less than a half of a second of vision to focus on Steel as he came around the bimini of the boat. Luckily, Gordon Harrison is one of the best drivers I have seen in a while, and he managed to keep the action in a 40-foot area and just had to adjust a few angles each time to make the shot happen. In the end, we ended up with only a few good shots, and one that could really work for the cover. I still think this is one of the biggest “Cinderella shots” I have ever gotten in my life. Each time, the action was totally in a different spot with the background. And only one time out of 40ish shots did everything line up just right, where Steel was just out of the battleship, and the Red Bull boat was spread enough away from him. This was probably one of the funnest and most stressful trips I have been on all year, and I am stoked about how well everyone worked together to make the cover happen! I would also like to thank Cullen at Red Bull for making everything possible; this would not have happened without their support. Steel Lafferty from Alex Glass on Vimeo.